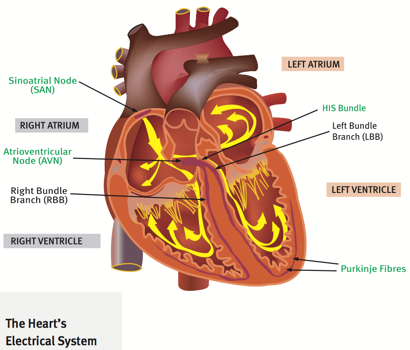 AF is a common and important disturbance of the electrical system of the heart. It is one of a number of disorders commonly referred to as ‘arrhythmias’ or ‘dysrhythmias’, in which the heart does not beat with a normal rhythm. If not recognized, and correctly treated, AF can result in significant problems, including stroke and heart failure. The heart is a highly efficient four-chamber pump (see diagram below). The upper chambers are called the atria and the lower, pumping chambers are called the ventricles. The ventricles do the hard work of pumping the blood to the other parts of the body. The right-sided chambers receive oxygen-depleted blood returning from the body through the veins and pump this blood to the lungs, where it is replenished with oxygen. The blood then returns via the pulmonary (lung) veins to the left-sided chambers, which pump this oxygenated blood to the rest of the body. The continuous firing of the sinus node creates the regular heart beat that can be felt as the pulse, heard with the stethoscope and recorded with an electrocardiograph – this is called Sinus Rhythm. The usual range of heart rates in sinus rhythm at rest is 60 – 80 beats per minute (bpm). During exercise the firing rate of the sinus node increases progressively. When the sinus rate exceeds 99 bpm the rhythm is called Sinus Tachycardia . Maximum heart rates in sinus tachycardia vary between individuals, largely dependent on age but many other factors including level of fitness. When the sinus rate is below 60 bpm the rhythm is termed Sinus Bradycardia. Sinus bradycardia at rates down to 40 bpm may be normal in some people, particularly those who are very fit, however very low heart rates are usually abnormal and cause symptoms. AF occurs when there are abnormal electrical impulses in the upper chambers of the heart (the atria). In AF, waves of chaotic electrical impulses travel through the atria in multiple directions, rather than the normal, highly regulated signals from the sinus node. These rapid, chaotic impulses cause the muscle fibres in the atria to quiver (or ‘fibrillate’). The AV node acts as a filter for much of this abnormal electrical activity in the atria. However the electrical impulses that do pass through to the ventricles are always transmitted irregularly and often fast, causing a rapid and irregular heartbeat. When the heart is in AF, it is not pumping regularly and therefore, not working as efficiently as it should be. The most common causes of AF are increasing age (above 65), long-term high blood pressure, coronary artery disease and valvular heart disease (problems with the valves of the heart). Another less common but treatable cause is hyperthyroidism (an overactive thyroid gland). AF can also be associated with chest trauma and/or surgery, caffeine intake and excessive consumption of alcohol. Certain types of medicine, as well as other diseases, such as pneumonia, can ‘trigger’ AF, but sometimes there is no apparent cause – it just happens. Some people experience AF as a ‘one-off’ episode; in others, it may come and go (‘paroxysmal’ AF) or persist (‘permanent’ or ‘chronic’ AF). Most people with AF may experience palpitations – that is, become aware of their heartbeat – and may actually feel irregular ‘fluttering’ of the heart. This fluttering is caused by the abnormal electrical signals in the atria reaching the ventricles and causing them to beat too rapidly and in an irregular pattern. Some people may notice that they have an irregular pulse. AF may also cause general feelings of fatigue, weakness, exercise intolerance, discomfort or dizziness, because the heart is not pumping efficiently. Occasionally this may result in fainting or collapse. Some people with AF may not notice any symptoms, however, it is still important to treat the condition, because it can lead to other problems. AF can cause a number of symptoms, as described above, and sometimes may be the first indication of underlying heart or coronary artery disease. In certain circumstances AF may to lead to the development of a blood clots within the atria. Blood flow within the atria can become quite sluggish, allowing blood to collect or ‘ pool’ in some areas promoting the development of clots. A particular area of concern is an out-pouching of the left atrium called the left atrial appendage where blood flow can be much more sluggish than that in the main body of the left atrium. If a piece of this clot (‘embolus’ or ‘emboli’) breaks off it may be carried from the heart through smaller and smaller blood vessels until it gets stuck, potentially blocking the blood supply to important organs. If the blockage occurs in a blood vessel supplying the brain, it can cause a stroke. Without treatment, the risk of stroke among people aged over 65 years with AF is about one in 20 per year, which is five to six times higher than those of similar age. The risk may be even higher if the AF is associated with damaged or diseased heart valves, or if the person has a history of high blood pressure, diabetes, heart failure or previous stroke. If AF is suspected, a number of tests including an electrocardiogram (ECG) and echocardiography (ultrasound of the heart) are usually done to confirm the diagnosis and look for any underlying cause (e.g. diseased heart valves) before treatment options are considered by your cardiologist. Most people with AF will need to take medicine (usually aspirin or warfarin) to prevent blood clots from forming. In addition, treatments may be needed to prevent the heart from beating too fast or to restore and maintain a normal heart rhythm. In some people, such as those with infrequent AF, long-term medicine may be all that is required to treat AF. In people in whom AF persists, cardioversion techniques may be used to restore a normal heart rhythm. If these approaches can’t be used or are unsuccessful, ablation procedures may be considered. These various treatments options are discussed during consultation with your cardiologist.